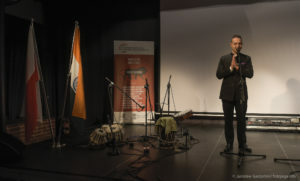 Over 100 companies based in Szczecin and the Western Pomerania Province have met on Tuesday in the Old Slaughterhouse on the invitation extended by Mariusz Łuszczewski, the President of the WICC, Shri Takhi, Chargé d’affaires at the Embassy of the Republic of India, and Olgierd Geblewicz, the Marshal of the Western Pomerania Province. The meeting coincided with the concert performed by Vidya Shah, the star of Indian ethnic music and the discussion on business opportunities. – Up until recently, Western Pomerania was a white spot on the map of Indian investment to Poland, said Shri Takhi. – After meeting you and encountering the energy and dedication of Mariusz Łuszczewski in establishing the Chamber, I am convinced that the region will soon become the most important location for Indian business. I should also invite you to invest in India. Although the WICC is the third organization in Poland to promote business cooperation between Polish and Indian companies, it is the first one to follow the formula of collaboration between a Polish region and an Indian state. The partner for cooperation with Western Pomerania is the State of Maharashtra, the third largest and the richest state of India proud of its robust economy. – I am very glad that so many companies are interested in business cooperation with their counterparts from India, said Mariusz Łuszczewski. – Equally important for me is the fact that we enjoy a strong support of the Indian Embassy right from the very beginning of our activity. The meeting, concert and presentation of the potential of the Indian economy by Mr. Surendra, the First Secretary at the Embassy responsible for economic affairs, mark the beginning of a series of activities promoting cooperation between businesses from our countries. The Western Pomerania-India Chamber of Commerce was established in the middle of November this year. In the past several weeks only, the initial group of 60 founding members grew by additional 40 companies based in Szczecin and the region.